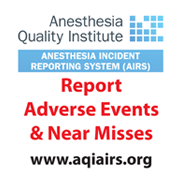 To request data from the Anesthesia Quality Institute (AQI) National Anesthesia Clinical Outcomes Registry (NACOR) please fill out the following form and then click submit. Please note the NACOR Participant User File is only available to active NACOR participants. Upon receipt of your form, the AQI will provide an email with instructions regarding next steps. Does your group or practice participate in AQI's NACOR? Research Objective:(Limit 150 characters) Characters Remain. Specific Research Question:(Limit 4000 characters) Characters Remain. Study Design:(Limit 4000 characters.) Characters Remain. Do you hope to publish?